Rocking Horse Toys make for excellent gifts for little ones, especially since the horse holds such a special place in the heart of Americans. Horses are not seen in most urban areas or on the routes between cities as they were a century ago, but their reputation has not washed out. Look through photos from vintage albums and you will surely find at least one with a child happily riding his horse toy. This love for horses is the purpose for which many people had a wooden horse toy when they were very young. These were created from real and solid wood and because of their durable development, they could last for a lot more than just a few years. Modern toy riding horses are built from steel and plastic. These materials have made them to look even more natural when the toys are brand new, but the majority of them cannot last more than several years before being removed due to the destruction that has happened to them from regular use. Toy rocking horses are just one of the many toys that can be discovered in a house. Barbie dolls had their own horses as well, as plenty of other toy selections do. It is a very typical equipment that toy producers have offered that go very well with the kids and even with their parents’ preferences. The main thing is that, for sure, the deep connections that people feel for horses will not disappear, so horse toys and games will remain a hot product on the shop racks. Because of their love for the equines, there are many enthusiasts that gather different designs of toy horses as collector products. There are especially designed horses created from wood, along with resins-based types and, of course the modern plastic horses. The level of details is the decision of the maker or specialist contributing to their manufacturing, so many toys are perfectly built and are basically a work of art that can be afforded only by rich collectors. From the oldest toys to the modern stuff found in a modern store, children will have practically every option possible to choose from, available in tons of sizes, models, price ranges, levels of difficulty tailored for all ages and dimensions. Currently, the rocking horse toy is not offered in one form, model, color or function. These conventional kid powered ride-ons come in a wide variety of styles and dimensions with lots of features, to the point where it can be very frustrating when you buy one as a present for your own kid. How do you select the best one? If you follow the recommendations written below, you can definitely return to the right track to buy rocking horse that will permanently stay in your children’s heart. Age suitability: This is so important for the protection of your kid. When shopping for a Toys “R” Us rocking horse, search only for products for which the maker details a suggested age in their information about the item. There are toy rocking horses for toddlers created particularly for small children, and then some created particularly for kids that are a bit older. This will help to filter down your choice. Price & variety: Rocking horse toys have a large variety in costs, from only a few tens of dollars to a few tens of thousands. If you set the finances before you begin looking and search just within a given cost range, due to the large varies in prices, you will definitely have success in finding one within your suggested money value. Material: A rocking horse can be created from wood, soft materials or from modern plastic. The plush toys usually have a solid frame from plastic or wood. Plastic products are generally very resilient, as they do not suffer too many damages if they are overused and washing is easy with a daily cleaning applied with tools found in most of the houses. 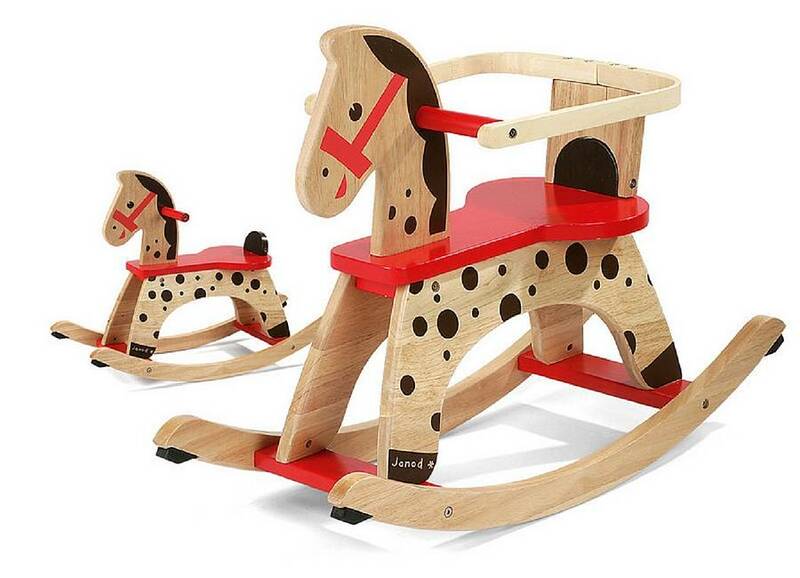 If you like to buy rocking horses that are high quality and that will last for a very long time, then a toy made from wood can be a better choice in this situation. The plush toys are designed for hugs and interaction between children. So, if the kid is the lovable type, then such a soft toy would be his best choice. Finishes: Look at how the item was finished in its details. Wood-made horses should have to be finished efficiently and all sides must be curved, not sharpened. Keep in mind that they might be varnished or colored by hand, so make sure that some non-toxic varnishes have been utilized in the process. There are ecological horse toys available that are colored with organic colors, so this way you will know that the kid will be protected in that respect. Also, when you are looking at the plastic or plastic types, again search for distinct sides or parts that might be easily drawn off. The plastic content have to be reasonably dense and the platform wide enough to prevent tipping. Size and Bodyweight Restrictions: Think about the size of your kid when selecting a horse toy. Generally, they come in various dimensions, such as small, medium and big. Also, check for the seat size. There are not many reasons for why a kid should have such a wonderful toy, if he cannot go onboard in a secure way. The item explanations by the producers must also include a limit, since it can help quite a lot when you are evaluating different designs. These points have been listed as extra information to assist the parents in finding the best horse toy for their kids. If you select the right one for the child, you will have satisfaction in thinking that you have purchased a great toy that is simply unique and amazing. Even more, thanks to the right choice, that unique toy you purchased could be passed on over the years, from your kid to his own and so on. What are the Best Rocking Horse Toys for Girls?